While the majority of New York’s Jewish community had settled in the Lower East Side, and the ever-expanding pilgrimage to Brooklyn continued; a smaller community was growing in Harlem as well. Escaping the claustrophobia of Orchard, Hester and Grand Streets was a luring and inviting alternative to the problem of over-crowding, with many families heading north towards the tip of the island. Harlem was still in development, growing quickly as the city continued to stretch itself upwards like a rising thermometer. While the streets were a little wider, they were not much safer, brewing with the same criminal element that preyed on its own. On Lenox Avenue, Harry Horowitz’s led a tough company of hoodlums, with muscle as their prime export. Horowitz may have realized early on that he didn’t have the necessary above average streets smarts, and the organizational edge one needs to climb the criminal ladder the way guys like his boss Big Jack Zelig did. Anyone who threw small bombs through windows primarily because, as quoted, “ I likes de noise they make” probably wasn’t quite ready to broker backroom deals with the likes of Tammany Hall. They ran their neighborhood and made themselves available to the bosses downtown, content in taking orders from Zelig. They were thugs for hire, stuck to the streets, and they liked it that way. bodyguard. His modest size and weight (5’4”, 140lbs) belied his brute strength and had an all around nasty reputation. He was well known for his notorious ability to break a man's back over his knee, something he would demonstrate from time to time in saloons on a measly two-dollar dare on a poor unsuspecting soul like some kind of macabre parlor trick. Horowitz would have perhaps remained a fiendish footnote to Jewish gangster lore was it not for his involvement in the fateful night of July 15, 1912; New York was in the midst of an unrelenting heat wave that summer month, and things were about to get hotter. At about 1:45 AM that morning, Horowitz, along with Louis ‘Lefty’ Rosenberg, Jacob ‘Whitey Lewis’ Seidenschmer and Frank ‘Dago Frank’ Cirofici, were in mid-town, parked across the street about a hundred feet from The Metropole Café on Forty-third street just near Broadway. The street was strangely quiet for such a busy part of town, even at that hour, and they had been previously assured that there would no police in the vicinity. A nervous fellow named Willie Shapiro sat behind the wheel of a rented gray 1909 Packard touring car, knowledgeable of the fact that the men in his rear view mirror were not just looking for a late night joy ride. As the motor idled, no one spoke to each other in the automobile and kept their heads down lost in thought, and waited. Word reached them from a figure across the street who tipped his hat in their direction. The four gunmen piled out of the back of the Packard and headed towards the entrance searching for cover in the shadows. A few moments later, a portly man with newspapers tucked under his right arm made his way down the steps of the café with a slight puzzled look on his face. One of them addressed him and said “ Over here Herman…” as the four moved towards him and raised their guns. Three bullets made their way into the body of Herman ‘Beansy’ Rosenthal before he even had a chance to realize what had happened. A fourth bullet strayed and embedded itself into the doorframe behind him. Lefty Louie approached closer and leaned over Rosenthal’s body, uttering the words “ Hello Herman…goodbye Herman”, squeezing off the fifth final bullet that blew off the top of his victim’s head. The four scrambled back into the car as it roared off up to Sixth Avenue and took a left uptown. Herman Rosenthal was dead and a city exploded. None of the triggermen involved realized the implications brought forth by the murder at the time it actually took place. This had been a job just like any other. They were taking care of some squealing gambler for reasons unbeknown to them, nor did they care, as long as there was a payday attached. They didn’t know their driver prior to that evening, and had only met the men who hired and made arrangements for them a month earlier. But they soon found out this was no ordinary hit. 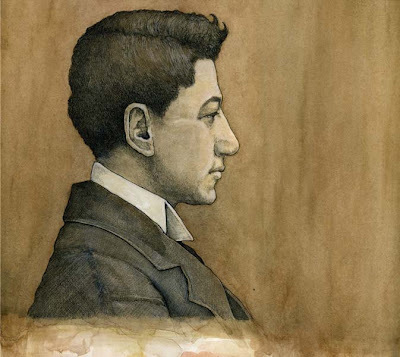 The murder of Herman Rosenthal reverberated and shook New York City in many ways politically and socially. Gyp and company were suddenly in the middle of a very complex and very public investigation of Rosenthal’s murder following his serious allegations of police corruption, and the direct involvement of Lieut. Charles Becker, head of the vice squad. Things got hot, so they did like any other good gangster would, and went into hiding. The one key element anyone involved with the murder never considered was the gray Packard and its license plate. According to some, this was possibly the first ever gangster hit using a getaway car as far as NYPD records were concerned. Willie Shapiro was one of the first to break under interrogation as the trail of the car rental first led back to him and his partner Louis Libby. Shapiro claimed he had never met any of the men prior to that evening, and that Jacob Rosensweig, aka Bald Jack Rose, was the one who rented and paid for the car. Rose walked into a precinct and gave himself up soon after in an effort to save his own skin once his name starting appearing in the papers. Over the next couple of weeks, through vigorous investigations by District Attorney Charles Whitman, more of Becker’s former underworld associates looking to avoid a walk to the electric chair came forth spilling all they knew. With enough evidence gathered for an indictment, Charles Becker himself was finally arrested and sent to the Tombs by the end of July to await his trial. Horowitz and friends were then pegged as the triggermen, and a countrywide manhunt for the gunmen was on. Both Lewis and Frank slipped and were captured rather easily by mid-August. Dago Frank had an opium habit he couldn’t seem to curb and was under its haze at the time of his arrest in Harlem. Lewis was picked up in the Catskills and brought back to town, where both he and Frank claimed innocence. During the following weeks, the police were still having hard time in locating Horowitz and Rosenberg, and D.A. Whitman arranged a special squad of agents to accomplish the task outside of the NYPD, suspicious the police was intentionally bungling the operation to protect Becker. Rumor of sightings and false arrests came as close as the Catskills and as far as Panama, with many overly eager law enforcers looking to cash in. Whitman had guessed from the start that they had never left New York and he was right. Through some keen detective work, both were caught with their pants down, literally, on September 14th. Gyp and Lefty had been holed up with their girlfriends in a third floor apartment located above a dry cleaner on Ridgewood Avenue, which straddled the border between Brooklyn and Queens. As detectives burst through the door, the stunned duo were sitting at a table in their underwear while their dinner was being prepared. They surrendered without resistance, but Gyp had a specific request. Realizing the case had become such a high profile affair; he was concerned about his appearance during his arraignment, knowledgeable that a storm of reporters would be waiting at the police station. He asked for permission to change into his best suit. He also became annoyed and agitated when he couldn’t find his hat. That was Gyp. He may have been caught, perhaps never to enjoy the freedom of the streets again, but was damned if he wasn't going to look good on his way out. An amused detective got him a spare hat from his car. While Charles Becker’s first of two lengthy trials was underway, a separate trial in November for the killing quartet lasted only seven days. Despite their confidence that they would be home for Thanksgiving, damaging testimony from Willie Shapiro and Bald Jack Rose had quelled their chances. Shapiro was justified in his fear of any witness stand prior to the killing of Big Jack Zelig, as he knew his life would have been endangered had he done so, as these after all, these were Zelig’s boys. With them safely in custody ,and Zelig’s murder three weeks prior to the trail’s first day, prosecution had finally convinced a shaky Shapiro to come forward. Bald Jack Rose was also brought in from the Becker trial by Whitman, and continued filling in details on the murder arrangements. The jury took only an hour and a half to deliver a guilty verdict. All sat as quietly with their heads down as they had in the back of that gray Packard a few months back. The judge handed down a sentence of death by the electric chair at Sing Sing. None of them were over the age of twenty-five. Another important factor played into all this as well. New York at the time had upwards of nine daily newspapers, all covering both cases daily since the night of the murder, and the trial and subsequent headlines had shook New York Jewry. Newspaper editors feared they would be encouraging forms of anti-Semitism with daily testimonies and references to very Jewish sounding surnames being dragged through the mud. With mounting pressure from the Jewish community, they reverted to their street monikers of all involved as such to make it all seem less like a specifically Jewish issue. Concerns that public awareness of Jewish crime rose considerably for really the first time, especially among Jews living above Fourteenth Street. The community was doing their best at administrating damage control, as it wasn’t a neighborhood problem anymore. One needs to also wonder how in touch the Horowitz and Rosenberg families had been with the daily lives of their sons, who were apparently shocked to hear of their involvement. A hardworking and religious Mr. Rosenberg had no idea his son was hanging out with hoodlums, and Mr. Horowitz, an active member of the local synagogue believed his son was an excellent student. On April 13, 1914 Horowitz, Rosenberg, Seidenschmer, along with Dago Frank, were put to death in the electric chair. Despite their inexcusable crimes, influential members of the Jewish community tried to have their execution stopped. It was the first time such highly publicized criminals of Jewish descent were to be executed, and feared the effect it would have. The execution marked a new heightened awareness of the serious criminal problem they had on their hands. Despite all last minute appeals, realizing all hope was lost; Rabbis were sent to their cells to pray with them in their last hours. Dago apparently blubbered like a baby on his way to the chair, while Whitey and Lefty only said a few words. Gyp kept mum until the end. As with all good conspiracies, hearsay and cover-ups, they all clinged to their innocence, along with Becker’s, right to the end. The one key player in the entire affair who could of perhaps provided many answers, and with whom the gunmen kept in touch with through letters while they were behind bars, was Big Jack Zelig himself. An assassin’s bullet a year and half earlier had silenced Zelig, and with him perhaps, also the truth. You sure know your stuff! Hey dclavin - thanks for sharing that info, its always nice to hear from those with possible family ties to these men - curious how you came across the blog..?? Just found this blog when researching my family heritage. It turns out that Gyp The Blood is actually my great great grandmother's cousin. Lilly, I've been trying to find out what country in Eastern Europe Gyp the Blood's family is from and discovered on this blog that you are RELATED. He has an unusual, very intelligent face, and the brutality you read about just doesn't seem to go with the face. I am really intrigued by that. Have researched my own family heritage back to early 19th century in Lithuania (on Jewish.Gen). I am always interested in the Jewish "back-story" to unusual people, e.g Gyp the Blood. Could you contact me? Also I'm a Yiddish translator / Yizkor book editor on Jewish.Gen (for the book LITA) if you want to look me up there (so you'll know I'm not a geek). Today Mom told me that I'm related to HH on my Dad's side. In fact, HH was the name on my Dad's birth certificate (b. 1908). I remember that Dad -- the youngest in his family but the only one born here (after the family had immigrated to the USA) -- was named after his paternal grandfather. Dad always said that his family came from Russia, but I believe it was actually from a region with a rather "flexible" national border. Wow, thank you so much for your reply! "Russia" is what so many emigrating Jews put on their papers, and it's true the borders kept moving around. And Czarist Russia was of course huge. The only real way to find out where anybody came from is if they mentioned a town and most of those were spelled in various goofy ways taking a lot of detective work. My grandparents on both sides told us a quite a bit, including stories as well as names, but I know that many Jews had such bad experiences back in "Russia" that they didn't want to talk about any of it. If your Dad was named after HH in 1908, there must have been still another HH further back in the family, since Gyp the Blood was still alive (I think, but I might be wrong. It's been a while since I read about all this). In that connection here's one more question for you -- was your Dad's Hebrew name Aaron? That name often became "Harry" in America. Thank you again for answering me! P.S. I just saw on the main page that HH died in 1914, so that means your Dad was named after an older Harry (or Aaron) Horowitz. That makes sense. Abbie Hoffman was another person whose family (geographical) origins I looked into. In a biography of him written by his brother, it says that the grandmother said that Abbie looked liked and reminded her a lot of a member of the family from a previous generation who was a hot-blooded revolutionary. Very interesting. Enjoyed reading this. Came to this blog by watching a WC Fields silent film about a pharmacist named Prettywillie in which he says that a baby is a combination of Peck's bad boy and Gyp the Blood. I wondered who Gyp the blood was and now I know. Thank-you. On researching my great-grandfather Morris Horowitz I discovered that he's buried in the same section of Mt. Zion Cemetery in Maspeth, NY as Harry "Gyp the Blood" Horowitz. If anyone knows of a family tree for Harry, would they please post the link on this blog? If it turns out that Harry and my great-grandfather were related it might help me find info on my gr-grandfather's brothers. Thanks! I have done a lot of research on my own family on JewishGen. I can help you if you have information that goes back to Eastern Europe, name of a town, anything like that. Anonymous: if you can tell me what year your gr-grandfather died, I can find out quite a bit from the Mt Zion Cemetery search, because the "societies" of each person are listed along with the date. These are landsmen societies created by immigrant Jews from the same town or locale. It would be very interesting to determine whether Gypsy the Blood and your gr-grandfather are somehow related because it would throw light on the East European origins of both. Towns and locales are not just odd names, they carry a lot of cultural associations -- e.g. Odessa for its criminals, etc. You can write to me at waterwindstars@gmail.com so as not to take up too much space on this topic here. If we find something about Harry, of course will share. Hope you will reply.